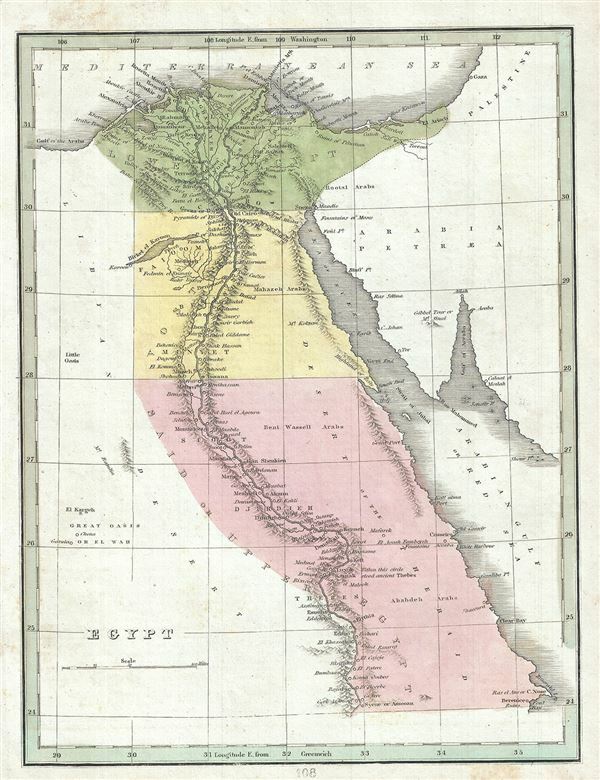 This fine map of Egypt was printed by the important American mapmaker T. G. Bradford in 1835. It depicts Egypt, centered on the Nile River from its delta on the Mediterranean south as far as Aswan. Egypt is here divided in to Mamluk provinces of Bahari (Lower Egypt), Vostani (Middle Egypt), and Said (Upper Egypt). Bradford's map notes numerous cities and villages along the river as well as various ancient Egyptian ruins including the Pyramids of Giza and the ancient city of Thebes. It also notes Valley of the Lakes of Natron home to numerous important Egyptian Coptic monasteries. Near Suez, Bradford identifies the Ancient Canal which would soon give way to a more modern variant. In the Sinai Peninsula, a mountain labeled 'Gibbel Tour' or Mt. Sinai is noted. Bradford prepared that map in the declining days of the Ottoman Empire. After the conquest of Palestine by Muhammad Ali's Egypt in 1832, British intervention returned control of Palestine to the Ottoman rulers in 1840. In Egypt, following the expulsion of the Napoleonic forces by the Ottoman Mamluk Turks, Muhammad Ali, the Ottoman viceroy of Egypt, established the Mamluk dynasty that would rule Egypt until the Egyptian Revolution of 1952. Between 1820 and 1833, Ali annexed northern Sudan, Syria and parts of Arabia into the Mamluk Empire. The map was published as plate no. 108 in Thomas G. Bradford's 1835 Comprehensive Atlas Geographical, Historical and Commercial. Bradford's atlas, published in 1835 was an important work on many levels. First, it was one of the first American atlases to follow an encyclopedic format, offering readers extensive geographical and statistical tables to supplement the maps themselves. Second, it was published in Boston and influenced the city's rise as a publishing center later in the 19th century (at the time most publishing in the United States was restricted to New York and Philadelphia). Third, this atlas was the first to contain a separate and specific map showing the Republic of Texas. Fourth and finally, Bradford's atlas in some instances broke the Euro-centric mold regarding atlas production. Among other things, Bradford focused his atlas on the Americas and abandoned the classical decoration common in European atlases in favor of a more informational and inherently American approach. Bradford published this atlas in several editions and with various partners. The first edition was published by William D. Ticktor and did not contain the iconic Republic of Texas map (although we have in fact seen Ticktor examples with a Texas map, suggesting, against conventional wisdom, that there may have been two Ticktor editions). The second official edition, published in the same year by the American Stationers Company, was the first to contain the Republic of Texas map, which is based on Austin's map, with two pages of descriptive text. A third edition was issued in 1836, also by American Stationers (though still dated 1835), and contained an unaltered Republic of Texas map with only a single page of descriptive test. A fourth edition appeared later, possibly 1837, and included an updated and revised map of Texas that replaces the old Mexican land grants with new inchoate counties. The maps from this atlas are an important addition to any collection focusing on early American cartography and Republic of Texas cartography.